Author, Donna Pyle, and LWML have teamed up to produce an eight-lesson Bible study Your Strong Suit based on Ephesians 6:10-18. Your Strong Suit is versatile and can be used in a number of settings. It is especially “portable” and can be done wherever there is a DVD player and women who are anxious to learn from the Word of God. It was filmed before an audience at Salem Lutheran Church, Tomball, Texas, and has undergone doctrinal review by the Lutheran Church—Missouri Synod. This eight week, verse-by-verse study of the armor of God details the incredible protection that God has provided to His children. Even though we may not like discussing spiritual warfare, it is necessary because it is real. Spiritual warfare has the potential to rob us of peace and security only to leave behind doubt and unrest. But God offers protection to us - HIS protection. Journey through this study as we learn about the battle, our enemy, our armor and our place in God's army. But most importantly, we come to know the rock solid truth that God has provided everything we need to proclaim ultimate victory. The study comes as eight lessons on two DVDs. Included is an 85-page, color-print workbook. 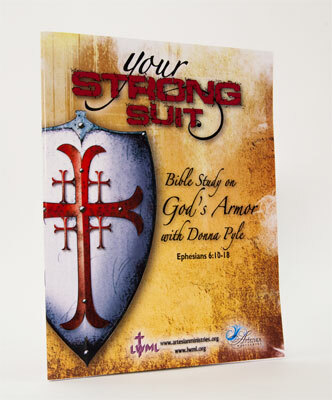 Additional Your Strong Suit workbooks (LWML68931) also available for purchase.